Oxygen rich blood is delivered to the body by means of arteries. Once the oxygen has been delivered veins are responsible for returning the blood to the heart. Veins, unlike arteries depend on the one way valve to keep the blood from flowing backwards. When a valve malfunctions, varicose veins can develop. One of the leading causes of varicose veins is heredity. Often our own future has been predetermined by our parents. 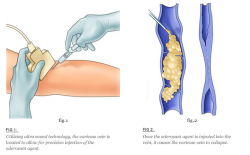 Both medical procedures and lifestyle changes are effective in dealing with varicose veins. The purpose of either course of action is to relieve the painful symptoms, improve the appearance, and prevent the problem from getting worse.